It is considered to be the task of a flag state to provide security to commercial vessels flying its flag (Spearin 2012). Yet flag states increasingly transfer this task by allowing ship-owners to hire Privately Contracted Armed Security Personnel (PCASP) in order to protect vessel, cargo, and crew against piracy. In the Indian Ocean, for example, there are reportedly over 140 companies providing armed protection to vessels, employing a minimum of 2,700 armed guards (Tondini 2012). Compared to the classic situation where PCASP operate on land, more actors (both states and non-state actors), nationalities and jurisdictions are involved when PCASP operate on the high seas. Matters are often complicated due to the possibility of overlapping jurisdictions for the prescription and/or the enforcement of rules. The use of PCASP to protect international trade at sea can thus be rather problematic in practice, particularly in terms of accountability for human rights violations. A recent book chapter by Jessica N.M. Schechinger addresses this issue. It analyses the legal implications of human rights violations at sea by PCASP, and discusses the possible responsibility of flag states under international law. There are several ways in which PCASP on board commercial vessels may be implicated in human rights violations. They can violate the right to life by either injuring or (unlawfully) killing an individual on board the commercial vessel they are located on. Vessels are often equated with the (land) territory of a flag state, and are subject to a state’s exclusive jurisdiction on the high seas. Furthermore, violations of the right to life can take place on the high seas, where no state has territorial sovereignty (Articles 87 and 89 Law of the Sea Convention), and in principle no state has exclusive (territorial) jurisdiction. 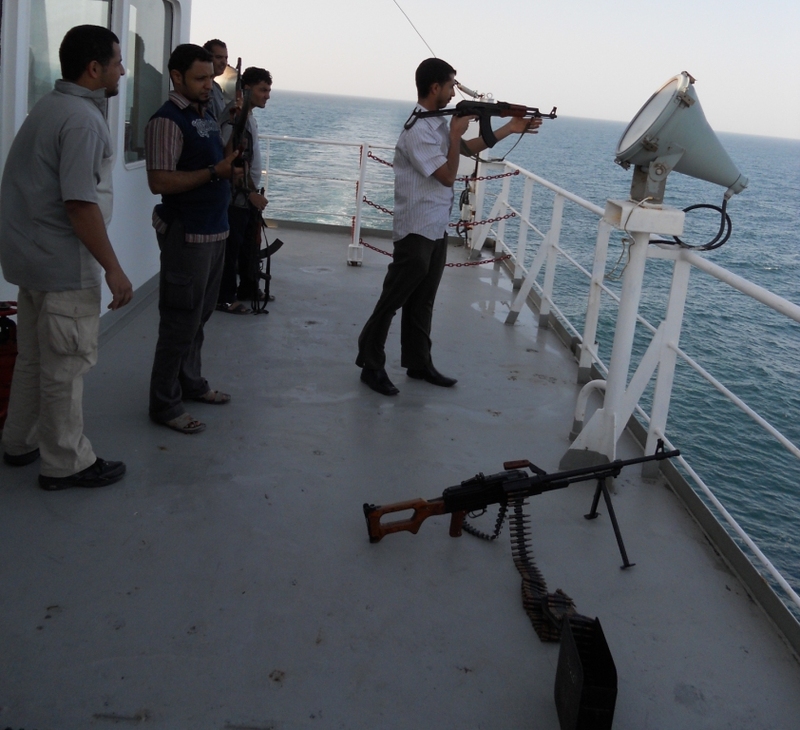 This is the case when PCASP shoot from a commercial vessel at a (suspected) pirate vessel to repel an attack. An individual, being either a pirate or innocent fisherman, may in this case be injured or killed in the course of an attack, by accident, and/or by misjudging a situation. Violations committed against individuals on the high seas are relevant for present purposes. Human rights violations resulting from the use of force by PCASP are not only of a theoretical nature. Incidents have occurred where small vessels, of the type used by both fishermen and pirates, have been found empty, or containing dead bodies, according to a researcher from the Clingendael Institute (see here in Dutch). This quote further illustrates the problem: ‘Fear of pirate attacks is creating more violent and chaotic seas, where some overzealous or untrained guards are shooting indiscriminately, killing pirates and sometimes innocent fishermen before verifying the threat.’ Incidents where PCASP may have committed human rights violations have only been reported once, but no one has been held accountable (BBC News 2010), and there was no investigation into the use of force by PCASP. Because it is currently not required to report incidents involving human rights violations on the high seas, and incidents are hard to detect, the scale of the problem is difficult to estimate. Another incident (although strictly speaking in the vessel protection detachment context) illustrating the possibility of human rights violations at sea is the Enrica Lexie case, involving an Italian oil tanker with Italian marines on board who misjudged a situation, and subsequently killed two Indian fishermen off the coast of India. International law seeking to regulate the certification, deployment, use of force, accountability, and oversight of PCASP operating at sea is currently either non-existent, or at best, in the process of being developed. The need to regulate PCASP operating at sea is more widely acknowledged (Ronzitti 2011; Priddy and Casey-Maslen 2012). The focus of the original chapter is on the role and obligations of flag states. Rights and obligations of flag states, under both international human rights law and the law of the sea are discussed, together with the possibility of (flag) state responsibility. However, also other actors have relevant rights and obligations concerning the issue at hand, and might thus be held responsible/accountable under international law for their acts. Due to the interaction between states and private actors, the concepts of ‘shared accountability’ and ‘shared responsibility’ may be applicable, see Nollkaemper and Jacobs 2013. Flag states have the choice to prohibit the use of PCASP on board ships flying their flag completely; to condition the use of PCASP on their vessels; or to allow PCASP on board their ships. The position and policies of (flag) states concerning the use of PCASP vary significantly. Some flag states allow arms to be taken on board on a case by case basis, while others prohibit PCASP to be on board of vessels flying their flag. While in principle there is nothing wrong with outsourcing security at sea, there is a risk that flag states do nothing in response to human rights violations that may take place as a consequence. Such outsourcing does not absolve flag states from their obligations under international law regarding PCASP, to whom they have de facto delegated the task of providing security. Whenever a flag state allows PCASP on board its vessels, it should make use of its exclusive prescriptive, enforcement, and adjudicatory jurisdiction on the high seas regarding PCASP activities. Arguably, combining obligations arising under the law of the sea and human rights law leads to the conclusion that when a flag state has allowed for PCASP on board its vessels, but has not enacted legislation to regulate their activities, it is by default responsible for failing to exercise the required measure of due diligence in instances where human rights violations were committed by PCASP. In addition, the obligation to investigate incidents involving alleged human rights abuses by PCASP may give rise to international responsibility for a flag state when it has failed to launch an investigation. International law currently does not specifically regulate this actor operating at sea. There is a lack of effective and binding regulation of the use of force, accountability, and oversight of PCASP, and specific shortcomings in addressing human rights abuses on the high seas exist. Advisory Council on International Affairs. 2010. ‘Combating piracy at sea: a reassessment of public and private responsibilities’, Advisory Report No. 72. Eboli, V. and Pierini, J.P. 2012. ‘Coastal State Jurisdiction over Vessel Protection Detachments and Immunity Issues: The Enrica Lexie Case’ Military Law and the Law of War Review 51: 117-148. König, D. 2009. ‘Flag of Ships’, in Max Planck Encyclopedia of Public International Law. Nollkaemper, P.A. and Jacobs, D. 2013. ‘Shared Responsibility in International Law: A Conceptual Framework’ Michigan Journal of International Law 34: 359-438. Priddy A. and Casey-Maslen S. 2012. ‘Counter-piracy Operations by Private Maritime Security Contractors – Key Legal Issues and Challenges’ Journal of International Criminal Justice 10 (4): 839-856. Ronzitti, N. 2011. ‘The Use of Private Contractors in the Fights against Piracy: Policy Options’, in Francioni, F. and Ronzitti, N. (eds. ), War by Contract: Human Rights, Humanitarian Law, and Private Contractors (Oxford University Press, 2011) 37-51. Schechinger, Jessica N.M. 2015 (forthcoming). ‘Responsibility for Human Rights Violations Arising from the Use of Privately Contracted Armed Security Personnel Against Piracy. Re-Emphasizing the Primary Role and Obligations of Flag States’, in Molenaar, E.J., Nouwen, S. and Ryngaert, C. (eds.). What is Wrong with International Law? Liber Amicorum A.H.A. Soons Brill. (the chapter has also been published as a working paper: Amsterdam Center for International Law No. 2014-30). Spearin, C. 2012. ‘Private Military and Security Companies v. International Naval Endeavours v. Somali Pirates – A Security Studies Perspective’ Journal of International Criminal Justice 10 (4): 823-837. Struwe, L.B. 2012. ‘Private Security Companies (PSCs) as a Piracy Countermeasure’ Studies in Conflict and Terrorism 35: 588-596. Tondini, M. 2012. ‘Some Legal and Non-Legal Reflections on the Use of Armed Protection Teams on Board Merchant Vessels: An Introduction to the Topic’ (2012) Military Law and the Law of War Review 51 (1): 7-19. Van Ginkel, B., Van Der Putten, F.-P. and Molenaar, W. 2013. ‘State or Private Protection against Maritime Piracy? – A Dutch Perspective’, Netherlands Institute of International Relations Clingendael Report. Jessica N.M. Schechinger (LLM Utrecht University), is a junior researcher in the research project on Shared Responsibility in International Law (SHARES) at the Amsterdam Center for International Law, University of Amsterdam. E-mail: jessica_schechinger@hotmail.com. is the research portal for the study of maritime security and ocean governance. It publishes commentaries based on academic research. It also acts as key repository of academic literature on the subject.